Nottingham is the home of the world famous ice dancers Torvill and Dean and they began skating on this site. The National Ice Centre is an impressive shiny replacement for the tired old rink that used to be here and inside you’ll find two olympic sized rinks. One is dedicated to public skating and the other one known as the arena which is used for shows, concerts and Nottingham Panthers Ice Hockey games. There are two ways to enjoy the National Ice Centre. Firstly by going to one of the public skating sessions and secondly by checking out which big name show is in the arena. Ice skating sessions are available daily but times do vary. There are usually two or three skating sessions per day in school holidays, but at other times there may only be one or two. Public skating is available most evenings. It costs £6 per person to skate in peak times (Friday night, Saturday, Sunday & school holidays) and £4.50 at other times (2012 prices). Skate hire costs £2. To check out the latest skating times, follow the National Ice Centre link below. 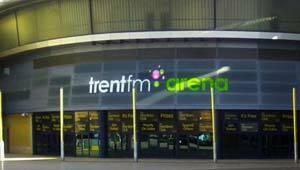 For shows, the building is known as the Capital FM Arena and performances take place most weeks. Some of the world’s biggest stars have performed here including Lionel Richie, Rihanna, Pink and Justin Bieber. The arena also hosts boxing title fights, darts events, musicals and dancing shows. Most of the big stars who perform at the National Ice Centre/Capital FM Arena stay at the nearby Lace Market Hotel. You can avoid the booking fee for any show or concert at the Arena by buying your tickets in person at the box office and paying in cash. This can reduce the price significantly compared to buying online from an agent. The National Ice Centre is on Lower Parliament Street at the edge of the Lace Market. Address: National Ice Centre (Capital FM Arena), Bolero Square, The Lace Market, Nottingham NG1 1LA, England.